The goal of ECEP is to have a significant impact on improving and broadening participation in computing education state by state. Increasing the number of computing and computing-intensive degree graduates, and the diversity of those graduates, requires systemic change to educational pathways. Why broaden participation in computing? Women, persons with disabilities, African Americans, Hispanics, Native Americans and indigenous peoples are notably absent in computing in K-12, higher education, and industry. These groups represent 70% of the population. ‘Without their participation, talents, and creativity, our nation cannot meet its imperative for a globally competitive, computationally savvy workforce and we cannot hope to achieve the appropriate scientific, technological and economic innovations that will serve our highly diverse society.’ (National Science Foundation) ECEP is committed to ensuring that states, state leaders, teachers, and researchers are prepared to tackle the lack of diversity in computing and computing intensive degrees. Students decide as early as their middle school years against computing as a career, but a quality high school computer science experience can change that decision. Underrepresented minority students may not gain access to quality computing education unless it is made available broadly in K-12. The diversity and reach of community colleges makes them attractive pathways for students if we can facilitate transfer and ensure success. 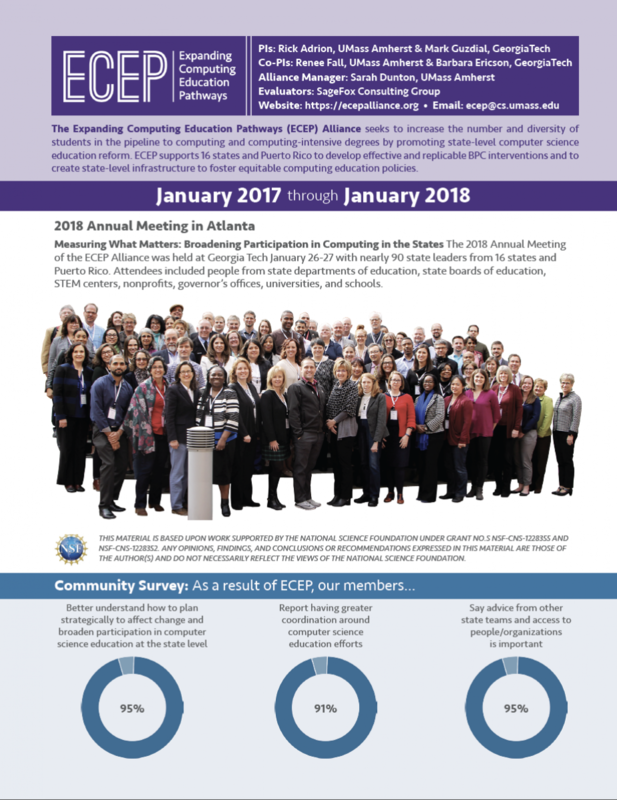 The Expanding Computing Education Pathways (ECEP) Alliance builds on five years of work by BPC projects in Massachusetts and Georgia—the Commonwealth Alliance for Information Technology Education (CAITE) and GeorgiaComputes! Together, these projects facilitated state-level systemic change that improved the quality of computing education and broadened participation in computing. ECEP began in partnership with California and South Carolina and has grown to include Alabama, Arkansas, Connecticut, Hawaii, Indiana, Maryland, Minnesota, Mississippi, New Hampshire, Nevada, North Carolina, Ohio, Oregon, Puerto Rico, Rhode Island, Texas, Utah, Virginia, and Washington to transfer this success to other states and regions, while at the same time building an alliance of thought leaders prepared to engage in this work together.